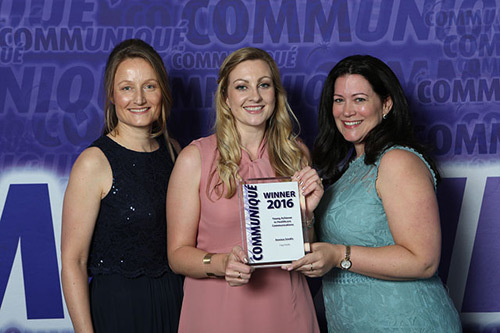 Virgo Health's Jessica Smith was named Young Achiever in Healthcare Communications at this year's Communiqué Awards in London on Thursday night. Jessica impressed the judges with her infectious optimism and energy for her work, as well as her passion and unwavering belief in the value communications brings to the healthcare arena. Commenting on her achievement, the Communiqué judges said: “Jessica thoroughly impressed each and every one of the judges with her all-round abilities. She first moved to Virgo Health from Publicis Life Brands Resolute in 2012 serving as an account manager, and has subsequently progressed to senior account director with the agency. Since joining, she has become an ambassador for healthcare communications within the global network of Virgo Health's parent company Golin, and now spearheads the agency's global strategy for its communications division. Her efforts led to a gold award for Virgo Health at the 2015 Golin 'Go All In' internal awards, with the agency the only healthcare entry to be recognised within the global network.